The Ebricks.com Stucco guide offers information about companies such as TransMineral USA, Inc. and Preservation Products, Inc..
New Mexico manufacturer of the original Earth Plaster, an all natural clay veneer for walls and ceilings. Also sealers, coloring pigments and texture add-ins. Manufacturer of exterior insulation and finishing systems (EIFS) and related products such as stucco, elastomeric coatings and decorative plasters. Site offers extensive technical information about products, plus distributor listings. Supplier of St. Astier natural lime plaster, mortars and paints for historic restoration, new homes and businesses. All products are free of volatile organic compounds and thus are environmentally friendly. This company markets an elastomeric weatherproofing systems developed with the unique needs of historic and older structures. Can be used on roofs, exterior walls and other places where a watertight coating is needed. Lightweight stone, brick and rock lookalike siding systems. Products are made from structural polyurethane and can be cut using standard tools and applied directly over wood sheathing. This company's offerings include Plaster-Weld, a product that allows plastering over drywall or any other structurally sound interior surface; and Weld-Crete, which bonds new concrete, stucco, and terrazzo to any structurally sound surface, interior or exterior. Pacific Northwest manufacturer of precast concrete stone veneer siding systems. Products distributed regionally & nationally. This company makes and markets a spray-on acrylic synthetic stucco system. Based in Buffalo, NY, this ornamental casting studio offers cast stone fireplace mantels, cast travertine range hoods, plus custom architectural sculpture, casting and restorations. 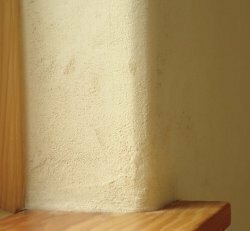 Clay plaster gives a textured, all-natural wall coating.